As part of my job I work with materials created by the company I work for, that is the archived materials. We have several collections of photos by people from around the world. In fact we might have as many as 40,000 photos, slides, and Negatives. Unfortunately most of these images have no Meta-data associated with them. It just happens to be the case that many of the retirees from our company still live around or volunteer in the offices. Much of the meta-data for these images lives in the minds of these retirees. Each image tells a story. As an archivist I want to be able to tell that story to many people. I do not know what that story is. I need to be able to sit down and listen to that story and make the notes on each photo. This is time consuming. More time consuming than I have. Here is my idea: Have 2 volunteers with iPads sit down with the retirees and show these pictures on the iPads to the retirees and then start collecting the data. The iPad app needs to be able to display the photos and then be able to allow the user to answer the above questions quickly and easily. 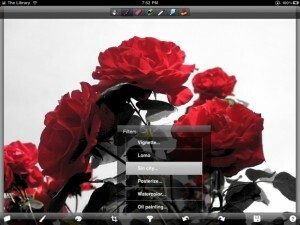 One app which has a really nice UI for editing photos is PhotoForge. [Review]. The iPad is only the first step though. The iPad works in one-on-one sessions working with one person at a time. Part of the overall strategy needs to be a cloud sourcing effort of meta-data collection. To implement this there needs to be central point of access where interested parties can have a many to one relationship with the content. This community added meta-data may have to be kept in a separate taxonomy until it can be verified by a curator, but there should be no reason that this community added meta-data can not be expected to be valid. However, what the app needs to do is more inline with MetaEditor 3.0. MetaEditor actually edits the IPTC tags in the photos – Allowing the meta-data to travel with the images.In one sense adding meta-data to an image is annotating an image. 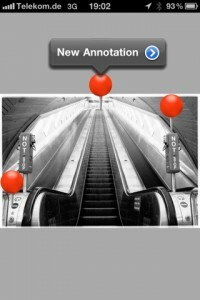 But this is something completely different than what Photo Annotate does to images. Photosmith seems to be a move in the right direction, but it is focused on working with Lightroom. Not with a social media platform like Gallery2 & Gallery3, Flickr or CopperMine.While looking at open source photo CMS’s one of the things we have to be aware of is that meta-data needs to come back to the archive in a doublin core “markup”. That is it needs to be mapped and integrated with our current DC aware meta-data scehma. So I looked into modules that make Gallery and Drupal “DC aware”. One of the challenges is that there are many photo management modules for drupal. None of them will do all we want and some of them will do what we want more elegantly (in a Code is Poetry sense). In drupal it is possible that several modules might do what we want. But what is still needed is a theme which elegantly, and intuitively pulls together the users, the content, the questions and the answers. No theme will do what we want out of the box. This is where Form, Function, Design and Development all come together – and each case, especially ours is unique. This, cloud sourcing of meta-data model has been implemented by the Library of Congress in the Chronicling America project. Where the Library of Congress is putting images out on Flickr and the public is annotating (or “enriching” or “tagging” ) them. 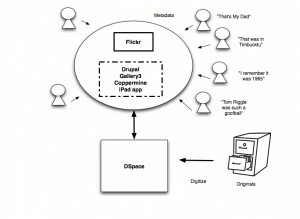 Flickr has something called Machine Tags, which are also used to enrich the content. 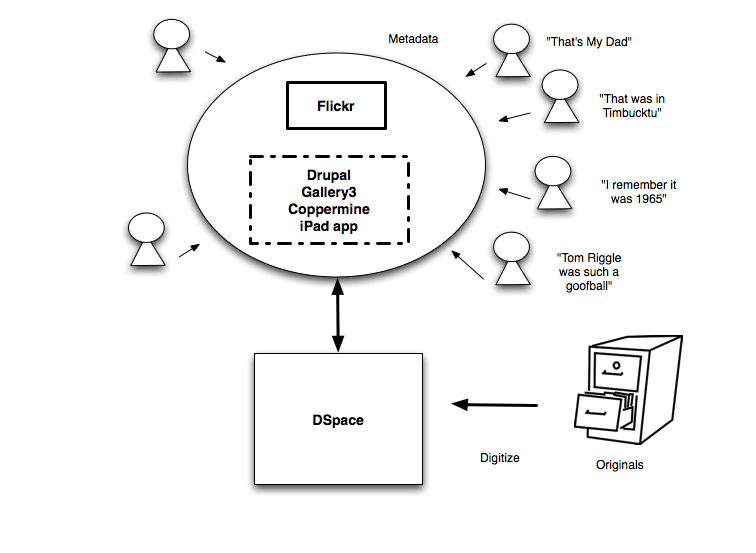 How do we sync offline iPad enriched photos with online hosted images? How do we sync the public face of the hosted images to the authoritative source for the images in the archive’s files?